In general, when professional traders are looking at the market to determine their next trade they can use two approaches. The approaches breakdown loosely into the the two following categories: fundamental analysis and technical analysis. In fundamental analysis a trader will review how the external economic, financial, political, environmental factors affect the value of a security. However, with technical analysis the trader is not interesting in the component factors that determine the market price of an asset. A technical analyst interprets market sentiment to derive conclusions about price trends. Essentially, by using technical analysis, the trader can understand the supply and demand of the market and use that information to estimate the future price trends of an asset. Any aspiring successful binary options trader or forex traders needs to learn technical analysis. By applying accurate technical analysis of financial markets you significantly increase your chances to for higher returns on trades with stocks, currencies, commodities, and indexes. I know technical analysis carries a lot of weight. It is one of the bedrocks for a successful career in trading, but don’t be intimidated. In the following article I will walk you through the learning process. If you are already familiar with technical analysis you can check out additional education material or start implementing more advanced strategies. Don’t be fooled by the name – this type of analysis is not only about technical analysis charts and graphs. Within technical analysis of financial markets there are systems that provide a trader with rules and methodology for understanding the market, allowing him or her to act with precision, reducing risk and raising profits. Like learning any new skill, the beginning is just that – the beginning. There is no limit to the amount you can learn about stock market technical analysis or technical analysis indicators . With each new piece of knowledge, your ability to gauge and act upon market sentiment will get sharper and sharper. If you really want to succeed as a binary options trader, you need to keep learning and improving your technical analysis abilities. What is technical analysis: the basics. The first thing you need to understand is the concept of a trend. Life is full of trends: political, fashion, entertainment etc. The trends that most interest us as traders are market trends, and just like fashion trends (when was the last time you put on those parachute pants?) market tends are always changing. A market trend essentially displays the changing price of an asset (stock, currency pair, commodity, index etc.) over time based on the willingness of buyers or sells to respectively buy or sell an asset at a specific price. Technical analysis charts are a great way to visually reflect the changing price of an asset over time. In fact, it is one of the first technical analysis tools you’ll need to get started. The direction of that change in price – up, down, flat – is what we is used to get a feel for market sentiment i.e. the market trend. Chart 1: The changing price of the EURUSD currency pair over time. Horizontal trend – a horizontal trend is defined as a balance between buyers and sellers in the market. Chart 2a: A classic horizontal trend – In a classic horizontal trend 2 peak highs as well as 2 peak lows are set in the same price range. Chart 2b: A triangle horizontal trend – In a triangle horizontal trend prices are set between 2 boundaries. As the prices converge (move closer together) the width of the highs and lows reduces creating a triangle shape. Chart 2c: An up trend triangle – With an uptrend triangle, the upper triangular rib is flat and the other rib is sent as an uptrend. With a downtrend triangle, the lower triangular rib is flat and the other rib is set as a downward trend. The most basic technical analysis indicators are resistance and support lines. They are relevant for stock market technical analysis or more general technical analysis of financial markets. As mentioned previously, the price of a security or asset is set by buyers and sellers. When there are more sellers, the market sentiment will display a downward trend. (This means supply increases while demand decreases.) When more people are trying to buy the asset or security, the market sentiment will display an upward trend. The price is going up because the supply decreases as the demand increases. oftenly what’s happen is that buyers and sellers are switching power at the same price level more than once? Support Line – occurs when the buyers take control from sellers – the demand increases so there is an upward trend. Resistance Line – occurs when the sellers take control from buyers – the demand decreases to there is a downward trend. To define a line of resistance or support all you need is two instances of a switch in the demand of the underlying asset. The reason for this ever changing switching power between buyers and sellers can vary. (That’s what makes trading so fun and challenging!) The cause can be a psychological price level such as 1.2 for EURUSD, fundamental news such as a change in interest rates, political events, and more! At the end of the day, it doesn’t matter what the reason is for the shift. What matters is the these moments of ‘switching control’ will increase the chances for a retrieve in the future. If, however, the price trend breaks through the support or resistance line, it increases the chances for a nice trade with great returns for trades who recognize and take advantage of the setup. Bottom line – pun absolutely intended – a resistance or support line can be used to identify a range between which prices display an uptrend or a downtrend. The most important data you need to mark a trend is the closing price of each timeframe unit. Because of its simplicity, the line chart is commonly used for very small timeframes such as seconds or ticks. Most binary options brokers provides this kind of chart for their clients. A line chart is all you need to mark trends and act upon breakpoints. The OHLC chart is more advanced than the line chart. It displays more information on the volatility of the market in each timeframe unit. 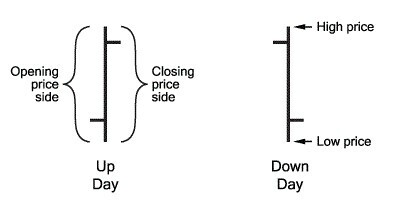 For instance, in the below images when the open price is set below the closing price it is an up unit and vice versa for a down unit. Usually an up unit will be marked in green and a down unit will be marked in red. A Japanese candlestick chart provides the same information as a OHCL bar chart. The only difference is that the body of each unit between the open and closed price is colored by the up or down movements of each unit. Because the only difference between a Candlestick and a Bar chart is appearance, the chart you choose to use for technical analysis of stock trends or any other financial trend is a matter of personal preference. I prefer to use the Japanese candlestick chart because it provides so many technical analysis indicators – signals and patterns – that by the end of day my risk is reduced while my potential for revenue is increased. Sometimes the best practice is to use a combination of charts. I often initiate my market observations with a quick view at a simple line chart. This gives me a clear picture to easily mark trends quickly. Once I have a sense of market sentiment then I dive in by switching to a Japanese candlesticks chart or, if you prefer, you can switch to an OHLC bar chart. Most binary option brokers provide their own chart platforms. Some of the charts provided are basic and some provide more advanced charts for the professional trader. In addition to providing you with a technique for analyzing charts, technical analysis also provides a methodology you should follow once you understand how to interpret data from charts and have embraced a particular strategy. The last thing you need is to pick a financial instrument. Below I will go through the difference between currencies, commodities, stock, and indexes. In forex technical analysis, the price of a currency pair is determined by their rate of reference – basically the exchange rate of one unit of currency to another. Main major currencies are characterized by high volume. They are great currency pairs to analyze. Majors – these are any currency pair against the USD which is not in the main group. Major currency pairs are characterized by high volume. Note, however, not all major currency pairs are fit to be analyzed. Cross – these are currency pairs that don’t include USD. Cross currency pairs are characterized by a medium volume with high volatility. Not all currency pairs are fit to be analyzed. All currency prices are mainly affected by rates (points). Stocks are ownerships shares in public companies. They are a more risky investment and should be analyzed based on a combination of fundamental and technical analysis. Remember: there is no limit for a stock to increase in price or decrease in price. Some stocks have a great technical chart. Before you start trading stocks you learn about the technical charts available. An index is essentially a set of stocks that have something in common. For instance, the index NASDAQ – 100 groups the largest non-financial securities. Most index related strategies relate to a specific index. In general indexes are less volatile than stocks and have greater technical characteristics. However, each index has its own characteristics. Commodity examples include: Crude Oil, Gold, Silver, Natural Gas, Corn etc. Volatility with commodities is very high. It is better to trade with larger timeframes (1 hour and above) and the learn the fundamental environment. Financial investigator, Trading Strategist and Private Investor. Thanks Albert. This is the best article that I found about the basics of trading technical analysis. I’ll come back to read it again, it is so useful.